I recently ran a thirty day poll on the gsprating website, and from those thirty days of input I noticed that a common answer was being clicked on day after day. The question was “What should be highest priority?” and to follow that question the optional answers were (Pricing and Rates, Up-time, Server Quality, Customer Service, or Technical Support) I was amazed by the overall answer that came from the poll. My personal opinion for this question would be to choose “Customer Service”. Having poor customer service but still a good product can really turn me off from any company, yet having great customer service and a poor product may keep me a customer for just a bit longer. 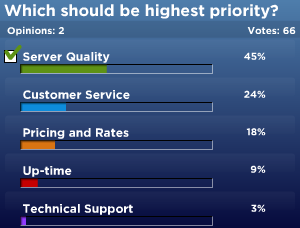 The overall response was to have higher “Server Quality” from their providers. I hope game server providers are taking notes from what the gamers are saying. Start by changing up your business model and service what your customers want and less of what you think they want.